Attention salmon fans! This recipe is going to knock your socks off. Get ready for some FLAVOR! The simple spice and brown sugar rub has a spicy kick with just a hint of sweetness. What’s unique about this dish is you can cook it a number of different ways and the results will be fantastic. This version is my husband’s favorite. He loves fish prepared with crispy skins. With a little butter and oil it is easily accomplished and you will feel like your dining at a fancy restaurant. Grill: Brush salmon entirely with evoo. Sprinkle then pat top side with rub. Set grill to medium-high heat. Spray with non-stick cooking spray to prevent sticking. Place salmon on the grill bottom side down ( I don’t recommend using skinned salmon for grilling because it tends to stick). Grill until salmon is almost cooked through. Gently flip and grill rub side down for a few minutes longer or until salmon is cooked to your liking. Broil: Place rack in upper 3rds of oven and set to broil. Line baking sheet with foil and lightly brush with evoo. Place salmon on foiled tray and brush entirely with evoo. Sprinkle then pat top side of salmon with rub. Place in the oven and broil until cooked to your liking. Whichever cooking method you choose, this salmon will be on your top favorites. For a complete meal serve with Garlic and Leek Red Mashed Potatoes and a salad! Bon Appétit! The rub for this salmon is phenomenal! The spice and brown sugar combination compliment each other perfectly. 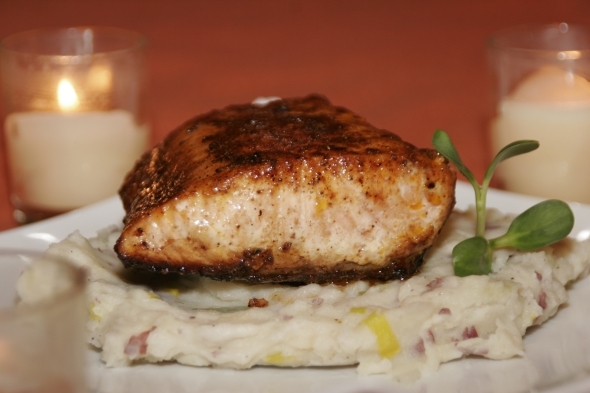 Follow this recipe for a glistening salmon with crispy skins and serve over Garlic and Leek Mashed Potatoes for a complete meal. Mix all ingredients for the Spice and Brown Sugar Rub in a small mixing bowl and set aside. Pat salmon filets dry on all sides with paper towel. Rub skins with unsalted butter. Turn over and brush tops and sides with extra virgin olive oil. Sprinkle spice and brown sugar mixture all over and pat, about 1 tablespoon per filet. Set aside until spice mixture absorbs into the salmon, about 5 minutes. Heat a large scan pan or other large non-stick skillet on medium-high heat. Add 1 tablespoon unsalted butter and 1 tablespoon extra virgin olive oil to the pan. When oil and butter start to simmer place the fillets on the pan skins side down, spaced apart. Cook until skins are golden brown, carefully checking during cooking process to ensure that skins don’t stick or start to burn (lower heat if necessary, do not move fillets) about 12 minutes (salmon fillets should be three quarters of the way cooked through, cooking time may vary depending on thickness) Carefully turn fillets over to cook tops until salmon is cooked through, about 3 minutes longer. Remove from heat and immediately serve atop Garlic and Leek Mashed Potatoes.